May 29, 2007, 9:57 PM · NEW YORK - What on Earth could anyone find wrong with this Tchaikovsky Concerto? These were my thoughts as I listened to 15-year-old Robyn Bollinger, of New Jersey, as she played the first movement of the Tchaik for Stephen Clapp, violin professor and dean of the Juilliard School. She was the first performer for the first session of the Starling-DeLay Symposium on Violin Studies at Juilliard. What could he even say? I wondered. 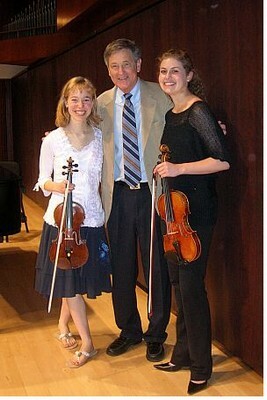 Violinists Robyn Bollinger and Stefani Collins stand with Stephen Clapp at Juilliard's Paul Recital Hall. Something about this young lady's joyful, smooth and seemingly problemless performance brought unexpected tears to my eyes. Not just the simple tears of feeling moved by music, either. More like the tears of a great burden, lifted. What can anyone find wrong...People have found something wrong with the Tchaikovsky Concerto ever since Leopold Auer received the gift of its composition for him with the now-legendary pronouncement, "It's unplayable!" As one who has struggled to play the piece, I can say that it can feel so wrong. One goes for a lesson on the Tchaik, and well, it's all wrong. It's so technically demanding, one wants to chuck the fiddle out the window. And it carries a certain musical stigma. Many musicians who have my deepest respect have something close to contempt for the piece. How could it be your favorite piece? It's just so full of moments that don't make musical sense, it's too sentimental, it's too Tchaikovsky, for heaven's sake! Yet I've always loved it dearly. And when Robyn played it today, it all made sense. It was so delightfully right! "I was told I could stop you after the cadenza," Clapp said, after she'd finished playing the entire 13-page first movement for us. "But I didn't want to keep you from the opportunity of playing the whole movement." Or keep us from hearing it, I'm thinking! He asked her how many times she'd performed the piece publicly, (seven), and how she had prepared. "Well, mostly performances in the living room," she said with a broad smile. Clapp emphasized that one's first performance of a piece is crucial and affects subsequent performances. "Preparing for the first performance is always critical," Clapp said. "You create a good experience the first time, and then you can create a good experience the second time, and the third time," it all builds on itself. He encouraged her to "look for those places where you can enjoy the music a little differently. Something that you have performed seven times, you want to find some little thing you can get excited about that's new." In the introduction, he encouraged her to look on the second note of the piece, the Bb, as an arrival, and to vary the bow speed. Next came Brandon Garbot, 13, of Oregon, who played the Fugue from Bach's G minor Sonata; a performance that was well-controlled, with good intonation and musical ideas. You could tell what a bunch of violin geeks were gathered in the room, when, in measure 38, Brandon chose...NOT to arpeggiate! Instead, he simply placed the appropriate chord at the beginning of each four notes. A low murmur, almost a gasp, swept through the room, as people checked their scores only to find, well, Bach never did really write that arpeggiation in there, either. But it's how we all do it! "I hadn't heard that before," Clapp said of the different interpretation. "I like it, it has a simplicity to it." He also noted that, in m. 47-50, which usually is played as all statement and echo, Brandon chose instead to crescendo on the last four notes. "Bach didn't write any dynamics, so you can do whatever you want," Clapp said. It occurred to me that you have to present a rather educated interpretation before anyone, teacher or audience, loosens the leash in Bach! Do whatever you want, hah! Another point Clapp made throughout the day is that your audience does not necessarily hear your performance the same way as you do. For student Hannah Tarley, who played part of the Beethoven "Spring" Sonata, this meant bringing up the volume for the lower registers of the violin, which seemed to disappear in the hall. "You may feel it's not musical," Clapp said of bringing out the bottom notes. "But if you'll just do it, even though it seems strange," it will help the performance. It really is hard to hear the difference between what is under the ear, and what is out in the hall. A teacher can almost just sing it back to make a the point; this is what Clapp did. I wasn't even listening for that, but once he pointed it out and got her playing louder lower, the interpretation made much more sense. Hu Shenghua, 20, of China, treated us to a Mendelssohn last movement with much spark, and Clapp told him he could go even farther. "In the practice room, go WILD!" Clapp said. "If you haven't experimented in how far you've taken something, then you won't know how far you can go in performance. The more you can go wild in the practice room, the more spontaneous you can get with an audience." Stefani Collins, of North Carolina, ended the master class with everyone's amorphous favorite, the Sibelius. It's such a picturesque piece, and though I thought she got it right, Clapp went deeper. "What is the landscape in this piece?" Clapp asked her. "Cold, and desolate," Stefani said. "You see long expanses, and then little notes," Clapp said. "The little notes need energy." He praised her warm vibrato, but then told her to cool it off for the beginning. "Stay in the ice cubes for a little while longer," he said. Indeed, it made for a much chillier beginning. "This creates a whole different landscape." The day ended with a recital by violinist Augustin Hadelich, 23, of Italy, the winner of the 2006 International Violin Competition of Indianapolis. He played with pianist Robert Kulek. During the lovely Mozart Sonata in F, K. 376, several cell phones interrupted. Somehow this modern intrusion is particularly jarring when performers are creating something so fine-tuned, when all the subtleties of sound are attended to with such great care. Fortunately, it didn't happen again! The Schnittke Sonata No. 1 was full of wonderful moments: a breathless quiet moment in the first movement; the commotion, sick carnival, railroad train and sustained G of the second movement; the redemptive chord that keeps returning in the third, which ended with wicked-high, whispering harmonics. And of course the fourth movement, which sounded to me like people exchanging a series of expletives, which turn to questions and answers, then ultimately into a dance. The pizzicato at the end was so controlled in its tapering dynamic, I was just in awe. I don't think anyone was breathing. As Hadelich played the Brahms G major sonata, I reflected on how many great musicians have played at Juilliard, played here just on the cusp of their greatness. What a delicate place they are in. How hard they have worked. They need a very particular kind of nurturing; something that will inspire an ambitious and talented player to keep striving, not to be content with whatever considerable accomplishments brought them thus far, but also not to be crushed by their own perfectionism. At the conclusion of Hadelich's recital, the audience came an immediate standing ovation, after which he played Chopin's C# major Nocturne as an encore. Let's hear it for these young artists, who have worked so hard! May 30, 2007 at 05:25 AM · Ringing cell phones at concerts should be confiscated and broken in half. May 30, 2007 at 05:28 AM · Oh, thank you so much for sharing your experience, Laurie! May 30, 2007 at 06:16 AM · That sounds really exciting, Laurie. You're lucky that you're able to attend, and we're lucky that you're sharing your experience with us. May 30, 2007 at 06:25 AM · By the way, Laurie, as far as I can tell, Hadelich is from Germany. May 30, 2007 at 07:01 AM · I really enjoyed reading this Laurie. Thanks for writing it. May 30, 2007 at 07:02 AM · I'm jealous. It was great last time, but I couldn't make it this year. Enjoy it, it's a great experience. For our sake, I hope that your subsequent entries are even more detailed. I love hearing about this. May 30, 2007 at 07:14 AM · I saw Mr. Clapp give a masterclass and...I call him Mr. Clapp. Miss Bollinger, shame on you! You made Laurie cry. 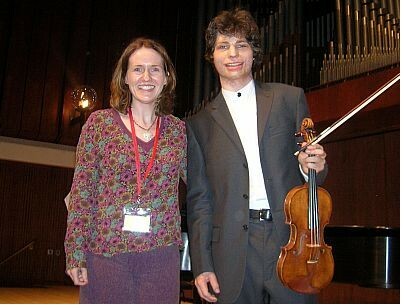 May 30, 2007 at 12:56 PM · Is that the violin awarded from the Indy competition in the photo? May 30, 2007 at 01:22 PM · Thank you so much for posting from the symposium. I was there (all the way from Perth, Australia) last time in 2005 and would have loved to be there this year. The detail that you are writing makes us feel like we're a part of it. We're saving up to get to the next symposium in 2009. May 30, 2007 at 01:32 PM · Ooh, great information. Trust a journalist to present it so well! May 30, 2007 at 02:55 PM · And Xerxes wept! A stunning report of people at their zenith. May 30, 2007 at 03:12 PM · Arrrrrrgh, I'm jealous. I know Robyn Bollinger! I went to a chamber music program with her last year! She's amazing, wish I could have heard her Tchaikovsky! May 30, 2007 at 03:52 PM · The violin pictured with Augustin is the Ex-Gingold Strad, granted for a period of four years to a Laureate of "The Indianapolis" competition. And, to clarify Augustin's origins, he is a German citizen and holds a German passport, however he was born and raised in Italy. May 30, 2007 at 05:45 PM · I'm jealous as well- what a great experience! I know Stefani Collins! We study with the same amazing teacher, Sarah Johnson, and I played with her brother in a quartet last summer! She's an absolutely fabulous player. Enjoy the rest of the symposium! May 30, 2007 at 07:20 PM · Really enjoyed reading this. Your blog entries of the event will probably be as close as I'll ever get to "experiencing" something like it. May 30, 2007 at 07:30 PM · Looking forward to reading your entries this week! May 30, 2007 at 09:34 PM · "As Hadelich played the Brahms G major sonata, I reflected on how many great musicians have played at Juilliard, played here just on the cusp of their greatness. What a delicate place they are in. How hard they have worked. They need a very particular kind of nurturing; something that will inspire an ambitious and talented player to keep striving, not to be content with whatever considerable accomplishments brought them thus far, but also not to be crushed by their own perfectionism." May 31, 2007 at 12:24 AM · Thank you so much for taking time to write about all this as well as provide photos. It's so exciting to read about it and provides inspiration to practice...it's almost like i was there. Please continue to write more, i can't waiting to read whatelse happens at the syposium. Thanks again! May 31, 2007 at 06:02 AM · I know Robyn personally (we were in a youth orchestra together) and I must say, she is one of the most caring and selfless people I know. She is very sweet and has extraordinary talent. It's rare you find a musician like her these days. Good for you Laurie and I like how you write! I am jealous as well. Sounds like a great time!